The picture book world is awash with stories of children who don’t want to put down their toys and go to bed. But for youngsters who don’t want playtime to end, who better to convince them to hit the hay than the toys themselves? In T.J. Hackworth’s delightful debut picture book Bedtime for Buzzy, a child is gently persuaded by each of his toys that they all need to rest. At the announcement of bedtime, Buzzy answers with a loud “NO!” Then, one by one, Buzzy’s toys relate how excited they are to continue their adventures with him—but first, they need some shut-eye. Just when Buzzy is beginning to nod off, he feels something poking him in his side. It’s “Courageous Explorer” riding his donkey and prodding Buzzy with his stick. The explorer is delighted to see Buzzy, noting that together they can find the City of Gold. “Oh, Good!” Buzzy says. “I was afraid I’d have to go to sleep, but now I can help you find the City of Gold instead!” Then the explorer makes the final case for bedtime: “We must find it in your dreams! That’s the only way. We hope you’ll help us!” And with that, Buzzy eagerly leaps into bed. The dialogue between Buzzy and his toys artfully captures a child’s active imagination and excitement over fantasized adventures. And Sean Baptist’s illustrations do more than inform the text—they bring it alive with expressive, colorful cartoon characters. Together, the text and pictures imbue the characters with a warm, winning joie de vivre that’s impossible to resist. 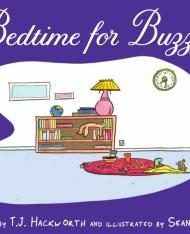 In sum, Bedtime for Buzzy is sure to be a hit for young readers—as well as their grateful parents.